When you go on a vacation, you will surely have snap a lot of pictures of the tourist attracts that you visit. For most people, they did not go ahead to print them out because it costs a lot of money to print color photos. Instead of printing out these photos, you can make them into a slideshow that you can watch at any time on your computer. You only need a basic slideshow creation software like Movavi Slideshow Maker for Mac to create a slideshow of your travel photos. With the slideshow maker, you can create as many slideshows as you want from your photo collections. There are tool tips that guide you how to create a slideshow on Mac. Movavi Slideshow Maker for Mac can be downloaded from the Movavi site. The trial version is free to test for up to 1 week and no feature is limited in the trial version. Movavi Slideshow Maker for Mac has a simple interface that consists of a timeline panel as the work area, a preview area, and main features can be accessed via the buttons on the left. The first step is to get your travel pictures to load into the timeline. You can do this either by dragging the pictures into the timeline or clicking on the Add Media Files button. You don’t have to be afraid of adding the pictures in the wrong sequence because the pictures sequence can be easily changed by dragging it from one place to another. Basic tools like crop, rotate and cut are within your easy reach from the toolbar above. When you want to edit a picture, you just select it and choose the tool that you want to use from the toolbar above. The duration of the image slide can be changed by clicking on the cog wheel button and entering the desired length in the Image duration field. Movavi Slideshow Maker for Mac supports a variety of transitions including simple and complex transitions. The transition tab is just below the T tab. You can preview a transition in the preview area before applying it onto your slide. To apply a transition, you select the transition style and drag it to in the space in between the two slide. Next, you can press the play button on the preview panel to play back the slideshow and see how it looks. The transition only plays for 2 seconds by default. But, you can change this in Transition Properties which can be assessed from the right click menu. In the Duration field, you are to enter the transition length. You can also add text to make any comment or remarks on the picture about your travels. In the text tab, you can find a lot of animated text styles. To add the animated text style, you should not drag it directly onto the slide but to the text row directly above the slide where you want to add the text. There are lots of fun title styles including breaking news, diamond, fading text and clean contrast. You can make your slideshow fantastic by adding some music in the background. 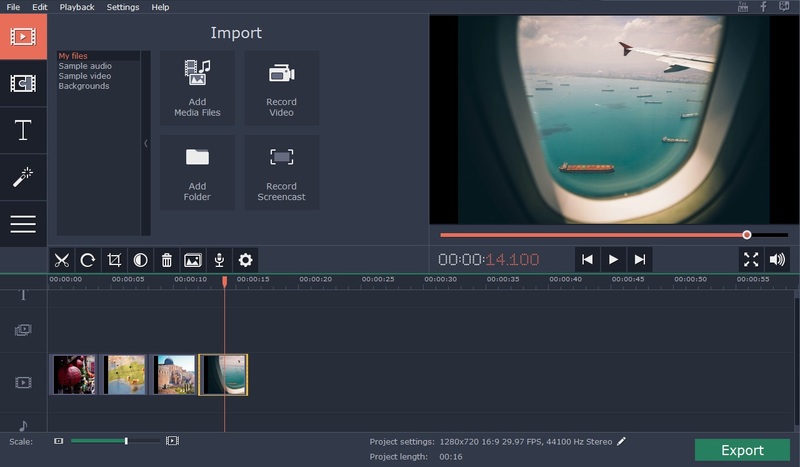 It allows you to overlay multiple number of audio tracks into the slideshow video. The scissor tool can be used to trim a long audio track and make it shorter. Movavi Slideshow Maker for Mac features a slideshow wizard that allows you to create a slideshow in 3 steps. If you don’t know where to start, you can choose the slideshow wizard option on the welcome screen that pop up when the software launch. When you are ready to save the slideshow, just click the export button and choose the appropriate video format. Finally, you can click the Start button to start the export process.